Pneumatic technology is usually associated with machine control, but at the Medical Design & Manufacturing West Conference in Anaheim, Calif., it was about music. 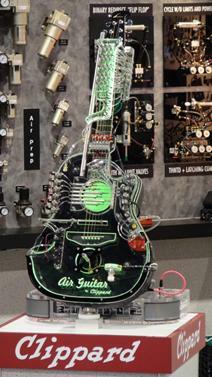 Clippard Instrument Laboratory Inc., a maker of pneumatic components, demonstrated a guitar that employs 62 air cylinders and 62 pneumatic valves to play music. The brainchild of company namesake Rob Clippard, the guitar uses a combination of 5/16th-inch and 5/32-inch air cylinders to strum its six strings. It also employs a half-inch-diameter cylinder to provide an "acoustic thump" for the music. "Rob's musical, and he grew up with Clippard technology, so he just combined the two," says Edward Ehrhardt, sales application engineer for Clippard. The Air Guitar plays Rob Clippard's own original songs, which are encoded in MIDI (musical instrument digital interface) protocol files. The files are communicated from an iPad to a microcontroller-based I/O board, which decides which valves to fire. At the show, the Air Guitar drew crowds as it played a running loop of Rob's music. The Air Guitar isn't his first foray into pneumatic music. He previously designed a 6-foot-diameter "music tree," which employed air to play strings, whistles, and cow bells. The musical tree is now housed at the Cincinnati Museum of Natural History.